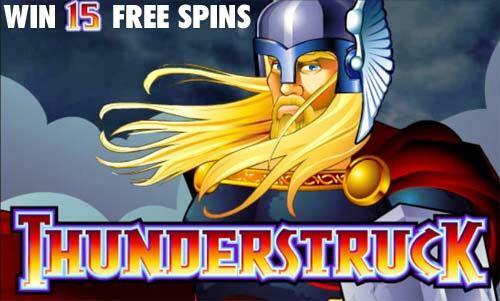 Thunderstruck has two Bonus Features, Free Spins & Gamble. The Ram symbol is a scatter symbol. Thunderstruck is a popular 5 Reel, 9 Payline slot by Microgaming. The game is based on the Scandinavian legend of the almighty Nordic God, Thor. Enjoy all the drama with lightning, thunder, hammers, chariots, rams, goats and a castle. Thunderstruck begins with an introductory video clip with Thor appearing as he prepares for battle. The music is loud and dramatic, the sci-fi graphics accompanied by a howling wind and thunderclaps. You win when 2 or more Rams symbols appear scattered anywhere on the 5 Reels. Receive 2x payout of any combination they complete. Thor can also act as both a Wild symbol and a Multiplier symbol. Get 15 Free Spins when landing on 3 or more Rams. Get another 3 symbols during the free spins and receive another 15 Free Spins. Guess the color or suit of the face down card. Guess the correct color and double your wins, guess the correct suit and your wins get multiplied by 4. 2 Thor symbols on an enabled payline will pay out 10x your bet on that payline. 3 Thor symbols pay 200x, 4 Thor symbols pay 2 000x, and 5 Thor symbols pay 10 000-to-1 Jackpot. Thunderstruck is one of the most popular online slots, play for or stand a chance to win that Jackpot when playing with real money. Enjoy the excitement of the great bonuses and tempting features of this great game. Take part in Norse mythology, fly through the skies with Thor’s Rams and feel the power!